The AAVSOnet Epoch Photometry Database comprises robotically-processed photometry obtained from all images taken with AAVSOnet telescopes. The major component of this database are observations from the Bright Star Monitor network, as these telescopes have taken the majority of images. There are smaller datasets from telescopes that were only operational during the early days of AAVSOnet, covering fewer targets but going much deeper and often with high cadence (time series). For all current telescopes, the intent is to provide public access to older data, leaving the more recent images for the original research proposed by AAVSO members. The Bright Star Monitor (BSM) Epoch Photometry Database (EPD) v1.0 contained 14 million photometric observations of approximately one million stars. Version 2.0 went online in February 2014 with approximately 20 million observations. Version 3.0 triples the size of the database to more than 66 million observations covering the time period of October 14, 2012 to September 30, 2015. The stars observed, both variable and constant, lie within fields observed with one of the Bright Star Monitor telescopes. Every frame taken with a BSM is photometered during processing, and magnitudes of every star from every available filter are extracted. These individual sets of measurements are also stamped with the time of observation, and so the full data set represents a time series for each of these one million stars. We are now releasing these data as a new resource for field photometry and data mining to the AAVSO Membership. 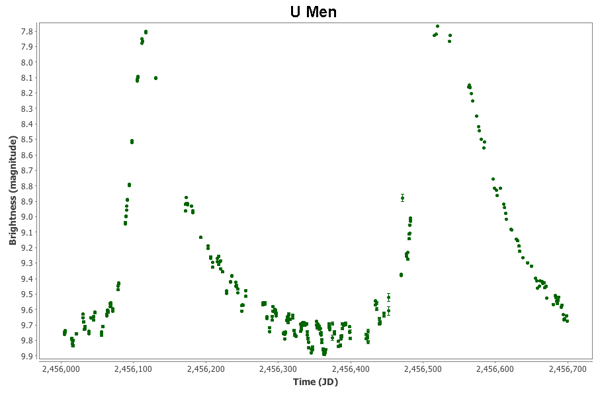 As an example of the data quality, here is a plot of U Men from the epoch photometry database. A few dozen objects are monitored more extensively than the typical field, and U Men is one of these. Note that this is an interesting object, with two superimposed pulsating stars - the long period Mira with a period of about 409 days, and a shorter period 10th magnitude companion about 0.6 arcsec distant and with period around 19 days. A complete list of the target field names contained in the BSM data release can be found here. 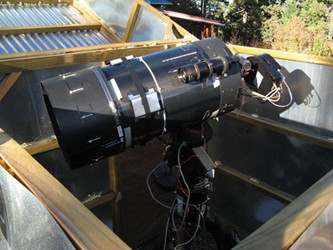 The Wright 28 (W28) EPD includes observations from this telescope that was sited at Astrokolhoz Observatory from February 2009 through October 2012. The telescope was a C11 OTA mounted on a Celestron CGE-Pro mount, using a focal reducer and an ST-7XME camera with a 10-position filter wheel. The image scale was 1.08 arcsec/pixel, giving a field of view of 13x9 arcmin. The telescope was heavily used for time series photometry of eclipsing binary stars. Approximately 177,960 science frames were taken, resulting in 4.9 million records. This dataset was zeropointed using APASS calibrations. A complete list of the target field names contained in the W28 data release can be found here. The Krajci 35 (K35) EPD includes observations from this telescope that was sited at Astrokolhoz Observatory from January 2011 through June 2012. The telescope was a C14 OTA mounted on a custom fork mount, using an STL-1001E camera with an 8-position filter wheel. The image scale was 1.24 arcsec/pixel, giving a field of view of 21x21 arcmin. The telescope was used for a variety of project, mostly of faint objects. Approximately 56,726 science frames were taken, resulting in 3.7 million records. This dataset was zeropointed using APASS calibrations. A complete list of the target field names contained in the K35 data release can be found here. If you are an AAVSO member, you may click here to access this database. Alternatively, you can access AAVSOnet data through use of VStar and its AAVSOnet epoch photometry observation source plug-in. If you are not an AAVSO member, please consider joining the AAVSO to support the work that we do! The AAVSOnet and its Epoch Photometry Database were made possible through the generous contributions of James Bedient, Donn Starkey, Doug Welch, Tom Krajci, Peter Nelson, Bill Stein, Greg Bolt, Bob Stine, Mike Linnolt, Richard Berry, David Benn, John Gross, Doug George (Cyanogen), Bob Denny (DC3 Dreams), and the Santa Barbara Instrument Group (SBIG).